I hope you have a brain with you today. This is Brain Awareness Week. Anyone who isn't aware of having a brain can return to a vegetative state. For the rest of you, since I am a professor I'll begin with a quiz. 1. Who is the brain? 2. Where is the brain? 3. What is the brain? 4. How does the brain work? The first question sounds a bit funny, so let's rephrase it: Who belongs to the brain that you have with you today? The brain a very special organ, quite unlike any other, in that it has a "who", or a self, that goes with it. The self that belongs to a brain has thoughts, emotions, perceptions, dreams, personality. These characteristics make up the "who" that you are. And as far as science can tell, these characteristics arise from the activities of the brain. I'd like you to think a bit about just where your self resides. Like so many things in life, it's easier to ask the question than it is to answer it. You know, of course, that you can cut off quite a few bits of your body without feeling any loss of self. And that's not limited to dead stuff like hair and fingernails. You can donate blood or bone marrow, packed with your very own living cells, without loss of self. And it doesn't really matter how much you give up. As long as it doesn't kill you, the quantity of "self" that you have remains exactly the same. Although most of us would rather not imagine living without our arms and legs, or without our eyes and ears, we also know it is possible. Helen Keller showed us how a wonderful self could exist without sight or hearing. And those of us who have watched a performance by the astrophysicist Stephen Hawking have seen that a vigorous self does not even depend on the working of one's own limbs or voice. As long as some means of prosthetic communication can be cobbled together, the self can thrive. The point, of course, is that only one part of your body cannot, not even in principle, be removed or prosthetically replaced without losing the self. That organ is your brain. Somehow, the "who" that you are is much more inextricably tangled up with your brain than it is with any of your other organs. A broken arm can interfere with carpentry or typing. A broken leg can interfere with running or dancing. But unlike broken bones, when something breaks in a brain, something very intimate and personal changes for the "who" that belongs to that brain. And yet, we must be perfectly clear about one thing. The brain is a physical organ of the body. Just as the heart is an organ which pumps blood, and the stomach is an organ which digests food, the brain is an organ which processes signals to produce meaningful thought and action. 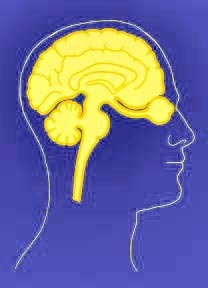 The activity of that organ is often called "the mind". Just as we sometimes use the word "heart" to mean spirit rather than blood pump, so we also sometimes use the word "mind" or "brain" to mean spirit. But the brain, like the heart, is a physical organ with a physical function. The brain has physical parts that carry out physical processes. That's the brain we'll be talking about today. Here I must also apologize. After reminding you that the self is somehow entangled with the brain, I'm not going to tell you how. What I intend to do with the rest of my time today is to try to get you used to the idea that your brain, this organ where your self resides, is itself a part of the body. It is a mechanism, a thing that has distinguishable working parts, just like your other organs. Although most us normally feel like there's just one "who" living inside, the brain is made of many regions, or modules, just like the skeleton is made of many bones. Each part works in its own way. Each part can be damaged. And damage to a particular piece of the brain interferes with some particular piece of the brain's function, just like a broken leg has different effects from a broken wrist or broken jaw. Okay, let's move on to the second question of the quiz: Where is the brain? If the "self" is associated with the brain, one might expect this question to have the same answer as the question, Where is the self? For most everyday purposes, we plainly feel that our self extends out to our skin. However, we've already seen that much of what is inside the skin is not crucial to self. On the other hand, anybody who works intimately with tools knows that one's sense of self extends out into the tool. When you drive a car, you feel the tires on the road. When you write with a pencil, you feel the texture of the paper through the tip of the pencil, just as clearly as if the pencil were an extension of yourself. And of course for many of us, our sense of self even embraces family and friends and out beyond. So, although the brain somehow houses the self, the location of self is going to remain just as much a mystery as how the self is produced by the brain. So let's come back to the brain as a physical organ. Where does the physical brain itself begin and end? Even this question is not simple. Of course there's a three pound lump of stuff floating in your cranium, suspended in a small amount of cerebrospinal fluid so it doesn't bounce against the bone. But the brain is not just the stuff in the cranium. Extending down from the back of the brain is the spinal cord, and there's no substantial reason to consider the spinal cord as something distinct from the brain. And then, extending out from both the brain and the spinal cord are many nerves, which go to all other parts of our bodies. Doctors and scientists usually refer to the brain and spinal cord together as the Central Nervous System, while the nerves are called the Peripheral Nervous System. But it's just one nervous system, extending throughout the body, and there's no reasonable place to divide the nervous system and say, "This here is brain, and this over here is not". To understand this better, we need to consider our third question. What is the brain? What kind of stuff is the brain made of? In some parts of the country, pig brains and cow brains are popular as food. If you've ever handled fresh brains from the grocery, you know that fresh brain stuff has the texture of pink pudding. As food, brains are quite nutritious, although rather high in cholesterol. The basic chemical composition of the brain is not much different from that of other organs. It's mostly water, protein and lipid, just like meat or liver, although proportions do differ from organ to organ. This shouldn't be too surprising, because all parts of our bodies are made of cells. The skin is made of skin cells, the liver is made of liver cells, and the brain is made of nerve cells. In many ways all the cells of the body are very much alike. Every cell is a tiny bag of water, surrounded by a fatty membrane, containing an assortment of proteins arranged into microscopic machines. And every thing that the body does, is done by cells. According to Rudolf Virchow, the great 19th Century pathologist, "All diseases are--in ultimate analysis--the result of disorders in cellular function." So we can be sure, if we want to understand the brain and how it can go wrong, we need to pay attention to its cells, to the stuff from which it is made. Quite literally, our cells are us. Here are three absolutely wonderful facts about nerve cells. The first and most wonderful is the fact that, working together, nerve cells can perceive and dream. They are us. This is magic of the highest sort. In the words of Sir Charles Sherrington, our nerve cells comprise "an enchanted loom" upon which our thoughts are woven. The second wonderful fact is that nerve cells are much like other cells. Each is a bag of water, surrounded by a fatty membrane and containing an assortment of molecules. There seems to be nothing about individual nerve cells that cannot be explained by basic chemistry and biology. The third wonderful fact is that each nerve cell has a truly magnificent shape. Somehow, this third fact bridges the gap between the mystery that is our brain and the chemistry that is our cells. Somewhere in the shape of nerve cells, in the complexity of connections among billions of such cells, and in the intricate pattern of activity that plays upon those cells, our "self" emerges. Each ordinary body cell is shaped more or less like a small ball or box or lump. Nerve cells also have a lump, called the cell body. But reaching out from the cell body there are many extensions called dendrites. Like the branches of a tree, the dendrites spread out into a space that may be as large as a pea, which is huge on the microscopic size scale of cells. 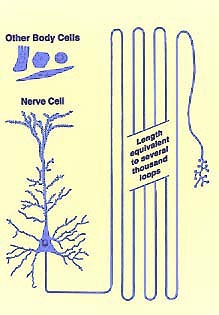 And each nerve cell has one long extension, called the axon, which reaches a stupendous long distance away. If the axon were drawn to scale in the accompanying illustration, it would need to be several hundred feet long. This is quite remarkable. We're used to thinking of cells as tiny, microscopic. Although nerve cells are indeed microscopically thin, they are very, very long. A typical nerve cell in the brain may be three or four inches long. Individual cells connect different parts directly with one another. 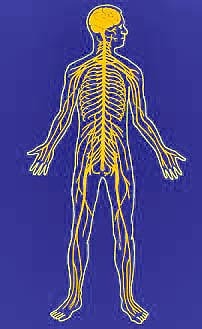 Quite a few nerve cells have axons that are several feet long. Some of these cells extend right across the boundary between the Central Nervous System and the Peripheral Nervous System, establishing back and forth connections with all parts of the entire body. This is what the brain is. It is cells like these. That brings us to our fourth question. How does the brain work? Science has two very different styles of answer to this question, and they're both encountered quite frequently. On the one hand, the brain presents to science the most profound unsolved mysteries remaining in biology. We can't really say how the brain creates a unitary, self-aware self. We don't really understand how the outside world is represented by our perceptions, or how we think, or how we dream. At this level, science remains deeply in the dark about how the brain works. But science can tell us which parts of the brain are used for vision, which ones for hearing, for speech, for emotion, for memory, for telling the left index finger or the right leg how to move. And science can tell us, in excruciating detail, exactly how some of the cells in these parts work. At this level, science can overwhelm us with information. We know which nerve cells connect to which. We know precisely how signals travel along nerve fibers. We have analyzed the chemicals which they use, in minute quantities, to pass signals from one nerve cell to another at their connecting points (called synapses). I'd like to share a bit of that knowledge with you. But let's do it by playing a couple of games, or do-it-yourself demonstrations, which rather strikingly draw a connection between what we do understand about how nerve cells work and the deep mystery of how the brain creates our perceptions. Hopefully, these little experiments will give you some sense of nerve cells at work. Let's begin with the "funny bone". This is audience participation. You all need to follow along. Hold up your left arm and put the fingertips of your right hand on the bony point of your left elbow. This point is the olecranon of the ulna. Now put your thumb on the bony knob which faces inward, toward your side. This is the medial condyle of the humerus. There is a groove between these two bony projections. If you now press one of your fingertips firmly into this groove on the bottom of your elbow, you should be able to feel the "funny bone". It feels like a bit of stiff string or wire. You can roll it from side to side by pressing against it. Okay? Now we're ready for our experiment. If you press very hard into the groove between the olecranon of the ulna and the medial condyle of the humerus, while rolling your fingertip across your "funny bone", you may feel a sudden tingling sensation in your little finger (pinkie) and ring finger. If you press really, really hard, and watch closely, you may even see a twitch of your fingers and thumb. Here's what's happening. Normally, when you touch something with your finger, you can feel it out at your fingertip. But for your "self" to be aware that your finger is touching anything, it's activity of cells up in the skull, in the cortex of the brain, that matters. To get signals about touch all the way up to the cortex of your brain, you have a chain of three nerve cells for each point of sensation on your skin. When the skin of your fingertip is disturbed, a nerve signal starts out. That first cell reaches all the way from your fingertip to the base of your brain (near where the neck meets the skull). Then there's a second cell which relays the signal into the core of the brain, a region called the thalamus. Then a third cell relays the signal on up to the cerebral cortex, on the surface of the brain. We only become consciously aware of the signal when it reaches the cortex. [There's that deep mystery of "self" again; we don't really understand, yet, what aspects of nerve cell activity are critical for consciousness.] The lower cells can be active without us knowing. For example, if you pay close attention in the moment after you have accidently touched a hot stove, you'll notice something quite remarkable. If everything is working normally, a signal will start up this pathway. But before the signal gets beyond the spinal cord, the first cell that enters the spinal cord will pass the message to a cell within the spinal whose axon goes right back out again. The signal will also keep going up, but before the signal ever reaches the cortex, your hand will jerk away. 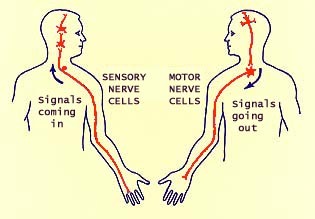 If you're alert, you actually have a moment to notice your hand jerk away, and wonder why, before the signal gets to your cortex and you become aware of pain. There is no conscious perception of the stimulus until the signal reaches the cortex, even though reflexes -- stimulus and response -- are still taking place at lower levels. If any upward nerve fiber is interrupted anywhere along the chain, for example by a spinal cord injury, we don't feel the touch. If the damage is high up, in the neck or within the cranium, activity can be perfectly normal in the lower cells. We can even have reflex activity still intact. But our "self" does not feel a thing. Anyway, normal sensation at our finger tips depends on passing information up this chain of three long nerve fibers. If we bypass the normal starting point, by tweaking our funny bone, we can experience the sensation of touch in a place where nothing is really happening. The same sort of thing can happen in the phenomenon of "phantom pain", where a patient who has had an amputation will feel sensations in the limb, even though the limb is no longer there. Disturbing the nerve causes accidental nerve signals, which then travel both ways away from the site of disturbance, both up and down all the fibers in the nerve. Some of those accidental signals eventually reach your brain. The brain automatically thinks that signals coming in from this nerve along this route started out in your fingers. So, when you tweak your funny bone, you (that is, the nerve cells of your brain) "feel" a tingling in your fingers, even though nothing is really happening in your fingers. The action was in your elbow, not in your fingers. The signals started in your elbow. But there's no act of will you can do that will make your brain stop feeling the sensation "in" your fingers. That's the way the brain is wired up, and that's the way it's going to work. Similarly, when you move your finger normally, a signal begins up inside your skull, where the voluntary decision is made. One brain cell then carries a signal down into the neck, and one more nerve cell extends out to the muscle that moves the finger. 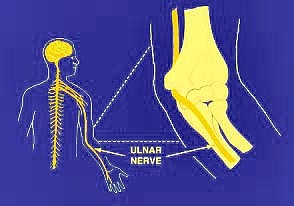 But when you bump your funny bone, signals get to your muscles which didn't start out with a voluntary decision. These signals didn't begin in your brain. They began in your elbow. But your muscles can't tell the difference between accidental signals and those representing normal commands from the brain. So the muscles twitch, causing your fingers to move. You might imagine that pressing on one side of the eye somehow causes something to happen on the other side, but that's not what's going on. The eye is responding directly to your touch, and sending signals from the retina at a spot immediately beneath the point where you are pressing. Those signals travel deep into the brain. But the brain "knows" that the eye has a lens like a camera that focuses an upside-down, reversed image of the world onto its "film". So the brain "knows" that any signal from the one side of the eye is telling about something happening in the opposite side of the visual world. What happens when you press your eyeball with your finger is similar to what happened with your funny bone. Your finger is disturbing nerve cells in your eye, so they're sending accidental signals. Signals from the eye are normally stimulated by light, so the brain interprets these accidental signals as light, not as touch. And the brain gives these accidental signals their normal meaning--signals from any spot in the retina mean something happening out through the lens in an opposite point in space. And once again, there's no act of will that make your brain see this shape where it "really" is, where your finger is pressing. Your nerve cells are connected so the brain has no choice. Let's do a little more with vision. The eye is often compared to a camera, but the light-sensitive retina in back of eye where the image is focussed, is living brain tissue, far more magical than any camera film. When you were an embryo in your mother's womb, your retina started out as a bubble reaching out from your embryonic brain. The retina really is part of the central nervous system. Part of your brain is inside your eyeball. The retina consists of three layers of cells. Light comes all the way through, until caught by cells in the back layer. These cells pass electrical signals along to cells in the second layer, which pass the signals along to the third layer. And cells in the third layer cells send signals deep into the brain. Along the way, the cells have been processing the signals, figuring out and emphasizing certain basic features like edges, where there's a contrast between colors or between light and dark. The signals from the retina travel along individual nerve fibers, along a route that has been well mapped. Cells in the eyeball send their axons into the thalamus, in the core of the brain. Nerve fibers from the next set of cells loop forward into the temporal lobe, then turn back and go directly to the visual cortex, which is located as far from the eye as it could be, in the very back end of the brain, called the occipetal lobe. There's a curious point here: Signals from the side of the eyeball near the temple stay on the same side of the head. 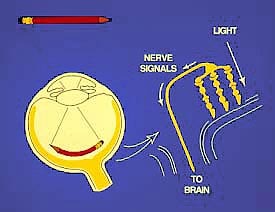 Signals from the side of eye near the nose go across to the opposite side of the brain. 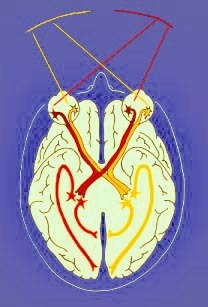 The crossover occurs at a place called the optic chiasm. We have separate images in our two eyes, but these are normally combined into a single impression of the world. Visual space is the world out there that you see. Each eye sees all of visual space, focussed upside-down by the lens onto the retina. So the left side of the world is projected onto the nose side of the left eye and the temple side of the right eye. And after the crossover, all the signals from this one side of visual space wind up on the right side of the brain, which happens to be the opposite side from where the real-world objects are. So all the signals representing the same part of visual space, from both separate eyes, wind up together in the same region of the brain. This pathway provides a way for neurologists to localize certain types of brain damage, because damage to particular sets of fibers causes particular types of deficits. If something damages nerve fibers between the eye and the chiasm, only signals from one eye are affected. If something damages fibers deep to the chiasm, signals from both eyes will be affected, but only in one-half of visual space. By the time signals get to visual cortex, the story of vision begins to get somewhat complicated, and very strange. I'm not going to elaborate much further here, except to point out that there does not seem to be any single place where our perception of the world comes together as a unified whole. We've just seen that, although our view of the world is unified, the left and right halves of that view are located in distinctly separate sites, one in each hemisphere of the brain. Furthermore, separate features of what we see are sent to separate regions of the cortex--colors to one place, outlines of objects to another, movement to yet another. We can get some hint of how cells are doing this from the phenomena of after-effects, when certain classes of cells become tired. You've all had the experience of catching a glimpse of direct sunlight, or a brilliant reflection off a car window, and having an after-image that lasts for several seconds. What has happened in that case is that the light receptor chemicals in the cells of the retina have been bleached out by the bright light so they can't react again until they have had a chance to recover. But there are much more subtle after-effects that reflect image processing at higher levels. You can demonstrate some of them to yourself, but only if you're careful and patient. I'll describe a couple examples, beginning with another demonstration. You might think that when you look at lines, it's a simple matter for your eye just to see which way the lines go. But the brain doesn't know what the actual optical image on the retina is like, it only knows what pattern of signals is occurring in its various cells. On the image below, first notice that both sets of lines on the right are vertical. Next, for about two minutes, fix your vision on the red bar at left center while scanning back and forth along the bar. After two minutes, shift your gaze to the red spot at right center and notice the apparent orientation of the "vertical" lines. Now, your brain has cells which respond to a greater or lesser extent depending to the orientation of edges. And you actually perceive the orientation based on the comparison of many cells. So, for example, when you look at a vertical edge, you see it as being vertical because that represents the average of all cells responding. Cells preferring the vertical orientation will be most active. Those preferring a tilt to the left will be less active, as will those preferring a tilt to the right, and the activity of those left-tilt and right-tilt cells will cancel one another out. But consider what happens if, beforehand, you look repeatedly at edges tilted to one side (as in the demonstration above). Then you'll tire out the cells that prefer that orientation. Now, when you look at vertical edges, they won't look vertical anymore. The lines will look tilted in the opposite direction. It's as if everything the brain sees, it judges as the result of a tug-o'-war among competing cells. If you tire out any of the teams, your brain won't get the right "balance" of signals from all the various cells that report on preferred orientation, and "you" won't "see" what's "really" there. I think the strangest of these familiar after-effect experiences is the motion illusion called the "waterfall effect". If you stare at a waterfall for several minutes, and then look steadily at a non-moving surface, that surface will appear to be sliding upwards. Some people experience this illusion after hours on the highway. I've encountered it most strongly after staring at the ground while mowing the lawn. 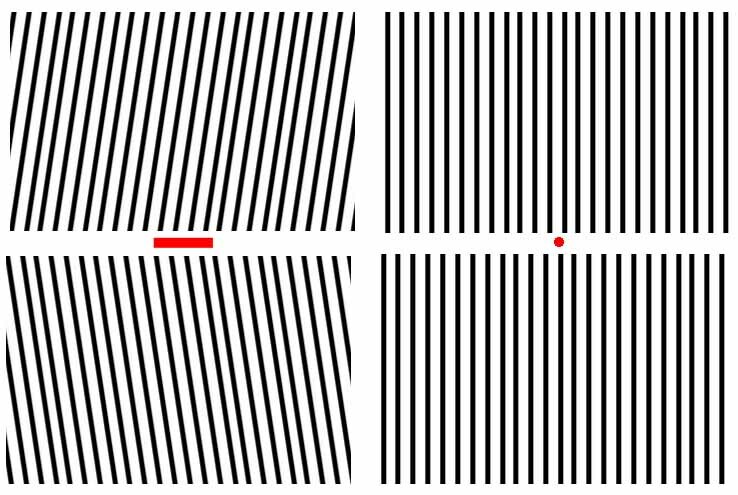 It's the darndest thing -- you can see that details in the the image are staying in the same place, but you can also see as plain as can be that the whole image is moving. The main point I want to make by mentioning these effects is that when we see the world out there, the cells in the brain are responding separately to different features--color, edge orientation, movement. And these responses are taking place in different places. There are people who, as a result of damage to a small region of their cortex, lose their ability to see color. There is at least one patient who lost her ability to see motion. She can see still images just fine. But she has trouble pouring coffee--she just sees a frozen stream, until suddenly there's coffee all over the table. And outdoors its downright dangerous,because she can't see the motion of cars--first a car is far away, then it's right beside her, without appearing to move. I can't imagine what this must be like, but I do understand that it makes sense, in terms of how the brain actually sees. When the brain works well, the resulting unity of experience is wonderful. But that's accomplished by many distinct groups of cells. Typically, when a part of the brain is damaged, whatever was done by those particular cells cannot be done any more (although, with time, other cells can sometimes take over some of the job). The study of brain injuries provides a wonderful window into the workings of the brain, and conversely, the study of the normal brain illuminates the nature of brain disease. While we're still thinking about vision, I'd like to offer one last exercise. First a quick bit of background. 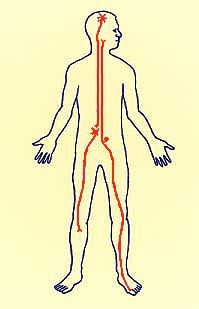 Nerve cells depend on continual blood supply, much more so than other types of cell. Deprive nerve cells of blood flow and they quickly quit working. After only a few minutes, they die. Doctors use the word ischemia to refer to abnormally reduced blood flow. A transient ischemic attack is a temporary (transient) loss of blood flow (ischemia) to some region of the brain. A stroke is similar but longer-lasting, leading to permanent damage. In this demonstration we're going to mimic a TIA, or transient ischemic attack. CAUTION: This demonstration has some potential for abuse that could cause serious, permanent damage, although when done according to directions, this demonstration should be quite safe. This demonstration is NOT appropriate for children. Proceed at your own risk, and ONLY if you do not have any eye problems such as glaucoma. We're going to observe the effect of reducing blood flow to the nerve cells in the eye. Nerve cells inside the eyeball need to be nourished by blood just like any other cells. Since the eyeball can't stretch, anything that increases the pressure inside the eyeball can stop the blood from flowing in. The disease glaucoma does that, and gradually kills nerve cells in the retina. You can do the same thing, momentarily, with your finger. Remember, try this at your own discretion, and only do it briefly. Okay? Cover one eye. Press gently, through the eyelid, against the eyeball of the UNcovered eye. After a few seconds vision that eye will begin to fade away. Release pressure immediately, before black-out is complete! Vision will quickly return as soon as you stop pressing. The gentle pressure prevents blood from flowing into the eyeball (it produces ischemia). Blood, of course, carries oxygen to cells. And with an inadequate supply of oxygen, the nerve cells in your retina stop sending signals. Nerve cells quit working after only a few seconds without a blood supply. Don't ever extend this demonstration beyond a few seconds! After only a few minutes without oxygen, nerve cells die. And unlike skin cells or liver cells, once dead, brain cells are usually not replaced. You've only got one brain, and that one is irreplaceable. No transplants. No prostheses. Take care of it. Eric Kandel, "Principles of Neural Science" (2000) -- This one is a heavy-duty textbook for medical students.